My film review that follows first appeared in the Jefferson Highway Declaration’s Winter edition, 2017. Last May, I met filmmakers and fellow JHA members Darrell Johnston, Leon, IA, and Josiah Laubenstein, Minneapolis, MN, in Itasca State Park at the “Source of the Mississippi River” in Minnesota. 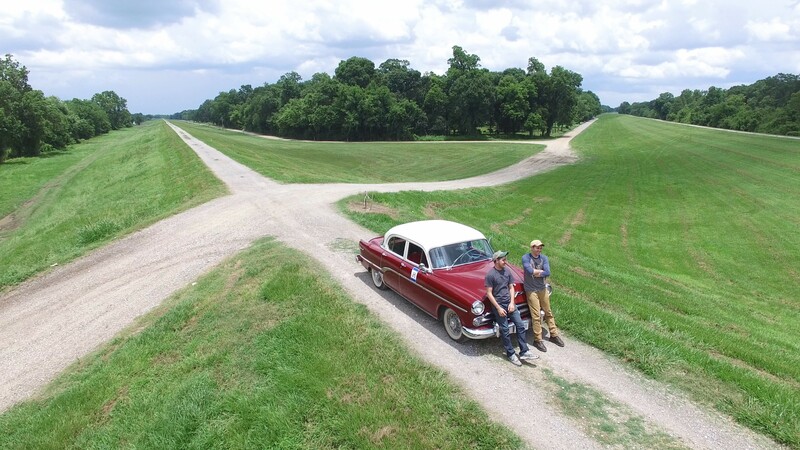 Park naturalist Connie Cox and I were impressed by their ambitions: they planned to travel the entire 2300 miles of the Jefferson Highway—Winnipeg to New Orleans—in a classic 1954 Dodge Royal. They would be stopping at selected communities to publicize the highway and to promote the issuing of proclamations by local officials in celebration of the centennial year of the first transnational highway through the Mississippi Valley. They planned to film their adventures and produce a documentary through their company, Highway Walkers Media—certainly an ambitious summer project. 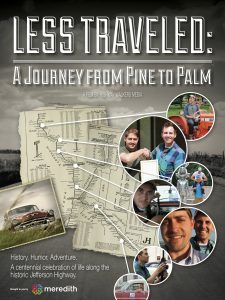 I was pleased to hear this past fall that their adventure went smoothly and that the result was the documentary Less Traveled: A Journey from Pine to Palm. The 130-minute film was not made to trace the exact route of the historic Jefferson Highway. Rather, it was an effort to visit the small towns that once were vibrant links in the important highway. 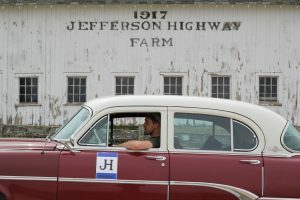 They planned to interview and interact with individuals who today live and work along the route: farmers, small town business people, construction workers, historians, naturalists, professors, local officials, and, of course, members of the Jefferson Highway Association. Their broad goals were to help us all better understand our nation’s past and to contemplate some of the changes occurring today along the route of the old highway. 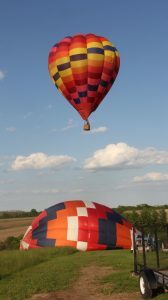 Along that route, these likable young men found a trove of mini-adventures to accent their story—from a visit to a historic Canadian fort, to crossing the slippery rocks at the source of the Mississippi River; from a ride in a hot air balloon at Indianola, IA, to a rodeo barrel race in Leon, IA. In Louisiana, they learned to eat crawfish—Louisiana style. As the Jefferson Highway coursed from Winnipeg to New Orleans, it met up with (and even briefly overlapped) several famous east-west highways—from the beginning, the Lincoln Highway, and later, Route 66. The film gives ample coverage to Reed/Niland Corner at the Lincoln-Jefferson intersection in Colo, IA. As for Route 66, it intersected the Jefferson Highway north of Muskogee, OK, near where Glenn Smith, the current JHA president, lives. Glenn makes a cameo appearance in the film, not only to shed light on the Jefferson Highway but also to give the filmmakers some bare-knuckle advice on how to start their Dodge after running out of gasoline. 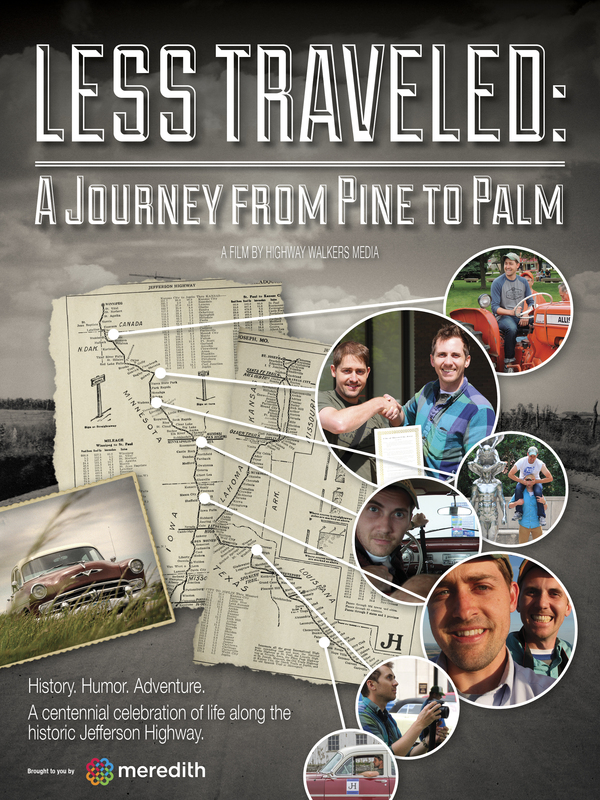 Because the slogans “Pine to Palm,” and “Palm to Pine” have both been used in connection with the old highway, the filmmakers made it a point to determine which was the correct description. 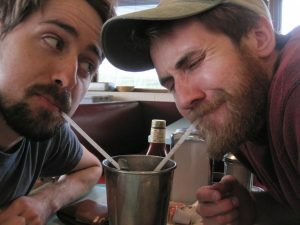 Viewers can find out what evidence caused the duo to agree on which city—Winnipeg, or New Orleans—was the beginning (or ending) of the highway. While the underlying light humor in the film is a treasure, there are some serious tones throughout as well, including comments from Dr. Anton Treuer, Professor of Ojibwe at Bemidji State University at Bemidji, Minnesota. He politely advised the filmmakers not to just look at the surface of the Jefferson Highway, but to think also of the history preceding it reaching back 10,000 years to when the first North Americans traveled along the same route. I found this documentary to be a carefree yet informative and thought provoking film. You will be not only entertained by it but left with a deeper understanding of our nation and a renewed interest in its customs and history. A DVD of the film can be obtained for $15. To place an order, go to www.HighwayWalkers.com and hit the “merchandise” tab. Or, to order by phone, call 641-414-3286 and send check to 324 NW 13th Drive, Leon, IA 50144. Also available at $25 is a companion to the film, a photo book entitled Less Traveled: A Journey down the Jefferson Highway, which the filmmakers describe as a “coffee-table book that shows iconic landmarks, rarely seen gems, and behind-the-scenes shots from the film.” To order a copy or to obtain more information, follow the same procedures indicated above. Click here to read my earlier blog post when I met with Darrell and Josiah during their journey through Park Rapids and Itasca State Park.